Where our ancestors come from, click to enlarge. According to this Tree, there is proof that the Noll's were living in Maraza since 1793 and the Kretz since 1842. A családfa szerint, és erre vannak hiteles adatok, a Noll család már 1793-tól, a Kretz család pedig 1842-töl Marázán élt. 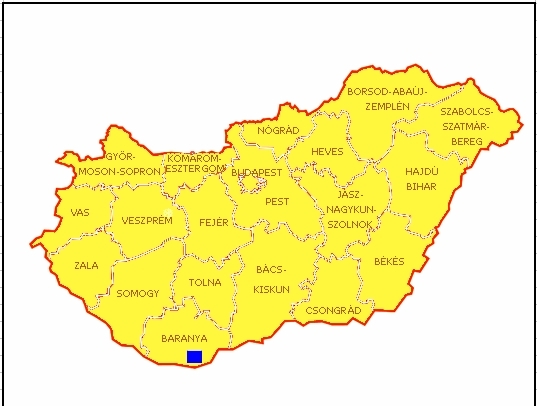 Baranya County, click to enlarge. Were their ancestors Hungarian born? Most probably not: they were Swabian Turkeys coming from Germany Early settlers had a history of several centuries before in Germany prior to their migration to Hungary. The term Swabian Turkey describes a region in southeastern Transdanubia in Hungary delimited by the Danube the Drava and Lake Balaton inhabited by an ethnic German minority. 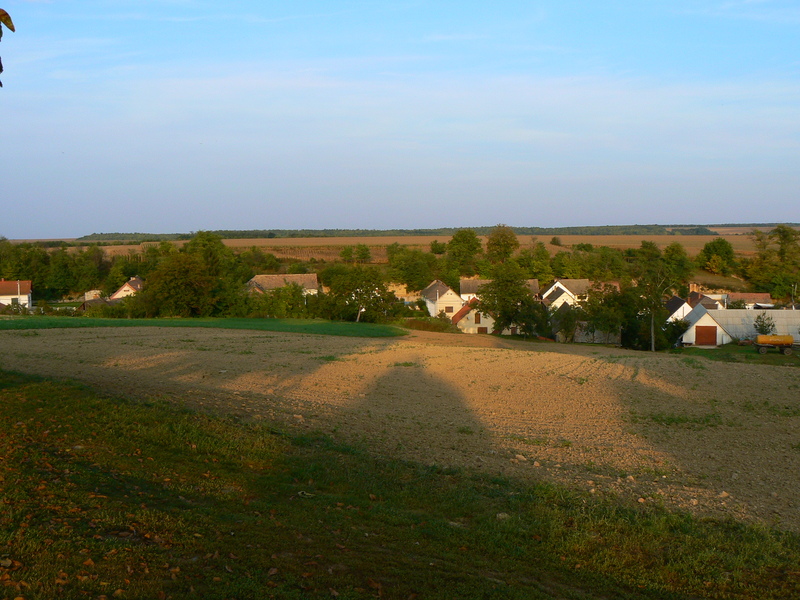 Is the largest German-speaking area in modern Hungary, and it once had the second largest Donauschwaben population. 1.1718 to 1737 = Caroline Colonization. This migration was technically restricted to Roman Catholics. 3.1782 to 1787 = Josephine colonization, under Joseph II. The colonization came to be known as "Great Swabian Trek". 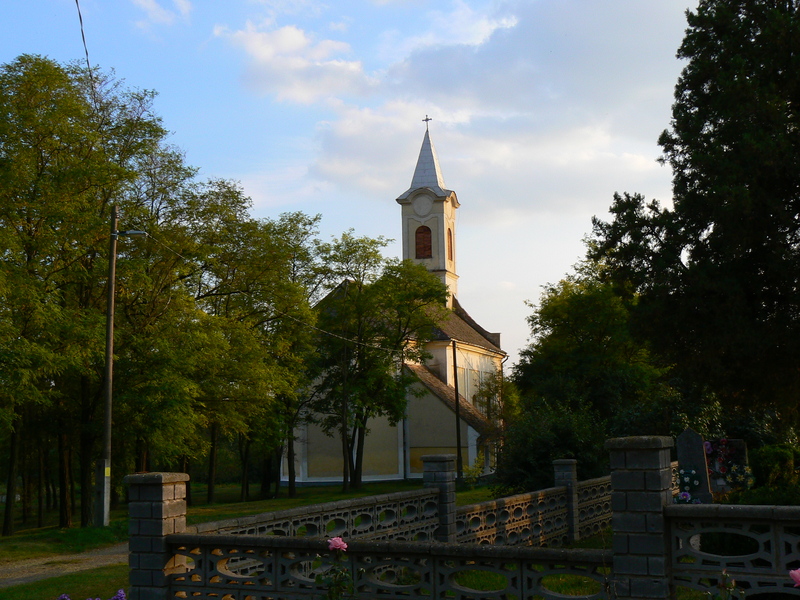 From 1711 to 1750, approximately 800 villages were founded in Hungary by German settlers. The 1828 Hungarian Property Tax Census (the “Census”), in Hungarian known as Vagyonösszeirás - 1828, is a census of individuals owning taxable property. The Census listed the individuals and their taxable holdings. Entries were handwritten in the Latin language and column headings on the Census forms were pre-printed in Latin. The entire country of Hungary was included. The entire Census has been microfilmed by the Church of Jesus Christ of Latter-day Saints (LDS) and comprises 319 microfilms. I asked the FamilySearch in Uruguay, to bring the 1828 census microfilm that had the village of Maraza included. Two years later, it arrived, and I could check it. I only found one name in it that census belonging to our family: Carolus Noll, that was at that moment 35 years old and had property in Maraza. 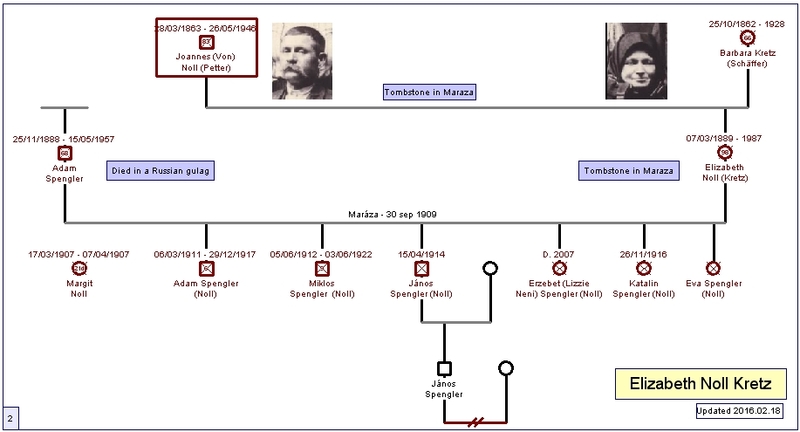 The genogram shows that the boys went to other villages to get brides, except for Borbala Kretz and her husband Johann Noll that were born in the same village. In other words, the bridegroom of a newly married couple brings his bride from a different village and their marriage takes place at the bride's domicile. To find out where she might come from, one has to start looking at marriage records in neighboring villages. And there, one also can find her birth certificate and who her ancestors were. Der Stanmbaum zeigt das die Nolls seit 1793 in Maraz wohnten und spätter 1842 in Kretz. [Wir werden vesuchen die Geburtsurkunden von weiteren Generationen zu finden]. Barbara Kretz wurde in Maraz geboren ebenso wie ihr Ehemann Johann Noll. Das Genogram zeigt das viele knaben in andere Dörfer gingen um Bräute zu finden. Die Hochzeit findet dann immer in der Stadt der Braut Statt. Um die richtige information zu finden muss man die verschieden Dörfer besuchen um dort die Geburtsurkunden ihren Vorfahren zu finden. Johan Noll married Barbala Kretz. The family believed that they had 11 children: 1 boy and 10 girls. According to the birth certificates I found, there was an Adam Noll Kretz, born in 1890. That would place him as the third older sibling and most probably he died as an infant, being that the reason no other member of the family knew about him. So far I found the birth data of 11 of the siblings ; still have to find out Vavi birth data to place her in the correct order of the siblings. A daughter of one of the Nolls was living in the village and she was the one that volunteered most of the information we have. The picture was taken in Pecs, when the girls went to serve in family houses. Top row from left to right: Anna, Janos, Mari, and Gertrud. Low row from left to right: Bálint Kretz, Borbala Kretz, Johann and Kati. Ich bin nicht sichen über die richtigen Geburtsdaten der Mädchen.Sie lebten in Maraz einem Dorf in Süd Ungan (Komitat Baranya) 170 km von Budapest. Eine Tochter der Nolls lebte in dem Dorf und sie wer diejenige von de rich die meisten informationen bekommen habe. Das Bild wurde in Pécs gemacht wo die Mädchen als Dienstmädchen gearbeited haben. Die obore reihe zeigt von links nach rechts: Anna, János, Mari, und Gertrud. Die untere reihe zeigt von links nach rechts: Bálint Kretz, Borbala Kretz, Johann und Kati. Small villages in the Baranya County, click to enlarge. Kleines dörf im Komitat Baranya, click zu vergrossern. Note: As the Noll-Kretz were getting married, more neighboring villages were included as living area for them and their descendants. In the chart above, I am including the villages related to János Noll and Karolin Noll (Maria's grandmother) descendants. The searching is in progress. Any data that a member of the family may contribute will be very welcome. Maraza is a small village, located in a valley in the eastern corner of Baranya County. The village was deserted during the Turkish rule. In 1730 German settlers began moving into the village and later also Hungarian-speaking people settled in. 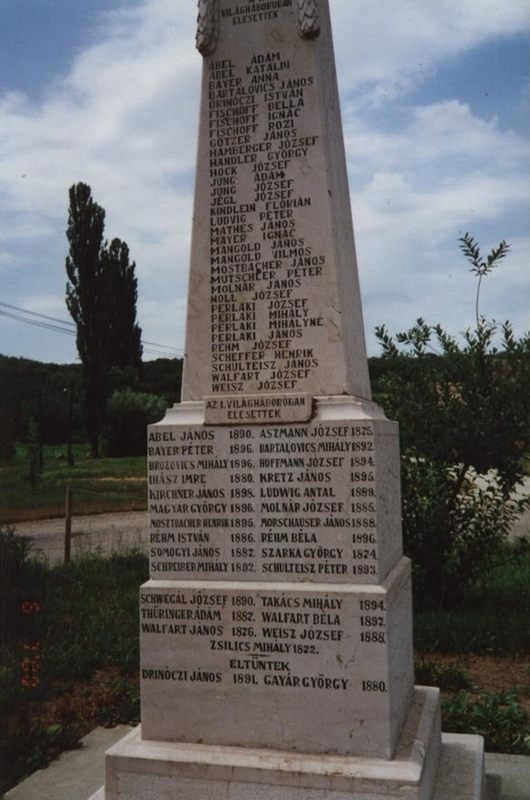 During the 1910 census Maraza had 731 inhabitants, of which 245 were Hungarian, 398 German, 88 Croatian. 531 were Roman Catholic, 27 Reformtus, 155 were Protestant. Maraza appears in the villages named in the 1828 Hungarian Census. On road it is accessible only via Geresdlak or Fazekasboda (both are at a distance of 7 kilometers from Maráza). The layout of the settlement is traditional. It has three streets and 103 houses. The number of the inhabitants of Maraza was 667 between the two world wars; in 1960 this number went down to 445 and today the number of inhabitants is only about 199 (1990 census: 224; 2001 census: 215; 1st January 2008 census: 199 inhabitants). They have always lived from agriculture. The village doctor and nurse come from the neighboring Geresdlak. Maraza contributes to the maintenance of the kindergarten and the primary school at Geresdlak. Als sich die Noll und Kretz Familie vermehrten haben sie sich in die Nachbar Dörfer verbreited. Im oberen Diagram sind die verwandten von Janos Noll und Karolin (Marias Grossmutter) aufgefuhrt. Jeder beitrag der Familie ist herzlich willkommen. Maraz ist ein kleinest Dorf und es befindet sich auf der östlichen seite des Baranya Bezirks. Das Dorf war verlassen während der Türkischen besetzung. In 1730 wurde des Dorf von Deutchen Einwanderen besiedelt und danach auch von Ungarn. Während des 1910 sensus hat men festgesellt das Maraz 731 Einwohner hatte von welchen 245 Ungarn waren 398 Deutche, 88 Kroatisch. 531 waren Römisch-katholische, 27 Ferformatus, 155 waren Protestantischer. Maraz erscheint erstmals als Dorf im 1928 sensus (Eine information die ich brauche). Man ereicht des Dorf nur über Geresdalk oder Fazekasboda (beide sind 7 km von Maraz Entfernung). Der Entwurf des Dorfes ist traditional es hat drei Strassen und 103 Häuser. Die Einwohner von Maraz war 667 zwischen den beiden kriegen; im 1960 diese nummer ging auf 445 und heute sind nur noch 199 Einwohner. (1990 sensus: 224; 2001 census: 215; 1st Jan 2008 sensus:199 menschen). View Maraza - Photo taken by Maria the 1st November 2006. Maraza's Church - Photo taken by Maria the 26th October 2006. 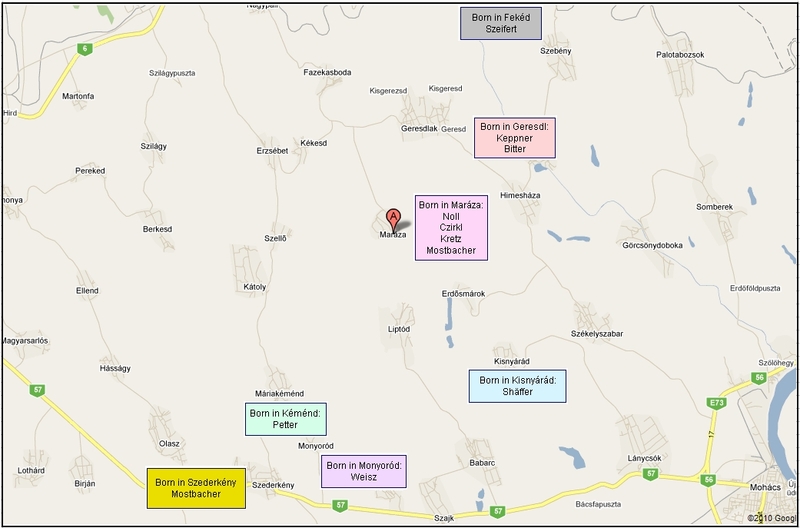 Margit Neni (daughter of Borbala Noll) was the last niece alive to live in Maraza, when this website started. 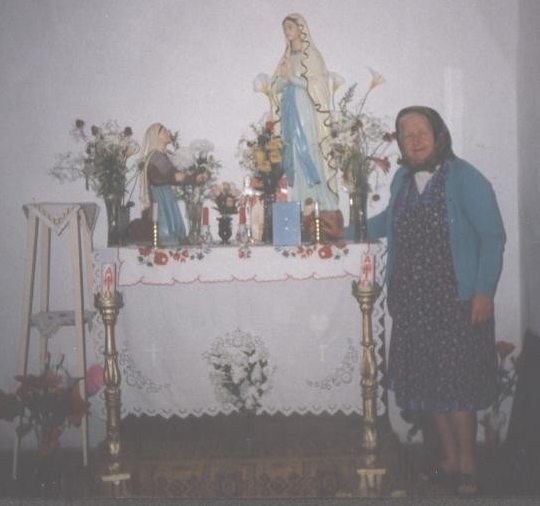 She was the living memory of the village and took care of the church. She was given the St.Peter's day’s award as recognition for a long time serving in the Diocese. She passed away 15th April 2009. Margit (Die Tochter von Barbara Noll) war die letzte nichte am Leben in Maraz als diese webseite startete. Maraz wusste viel uber die geschichte des dörfes und hat die Kirche betreut. Sie hat die St Peters medaile erworben fur dienste in der Gemeide. Photo taken by Carolina Sorbello Noll the 17th of April 2006 on her visit to Maraza. Das foto wurde gemacht bei Carolina Sorbello Noll am 17.4.2006 beim besuch to Maraz. Maraza Church - Photo taken by Maria the 5th of November 2008. The tombstones of most of the Nolls and Kretz are in the local cemetery. Die grabsteine der Nolls und Kretzes sind im Maraz gemeinde friedhof. 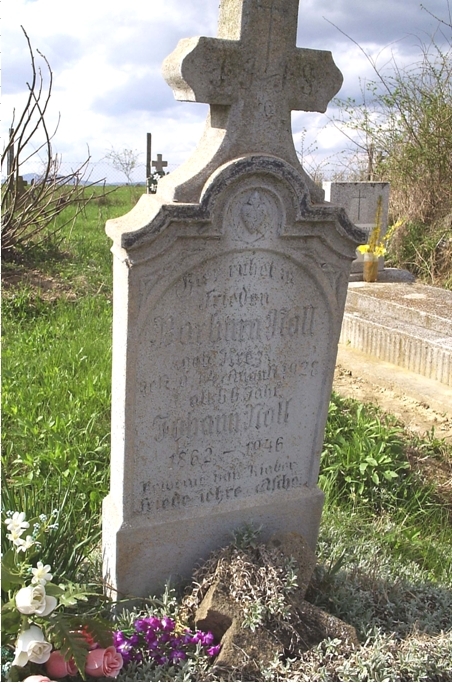 Barbara Noll and Johann Noll tombstone. 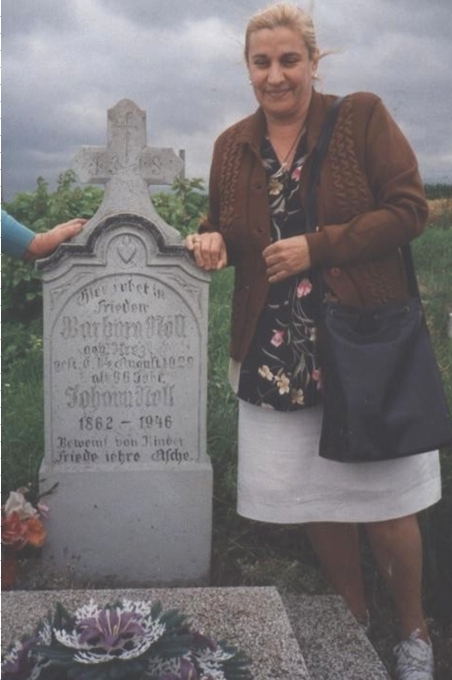 My late cousin Ana Noll when she visited Hungary, at our g-grandparents tombstone - photo taken in 1997. Meine verstorbene kusine Ana Noll als sie ungarn besucht hat - Foto aufgenommen im 1997. A chapter of the descendants of each Noll sibling will be developed with the data I have so far. 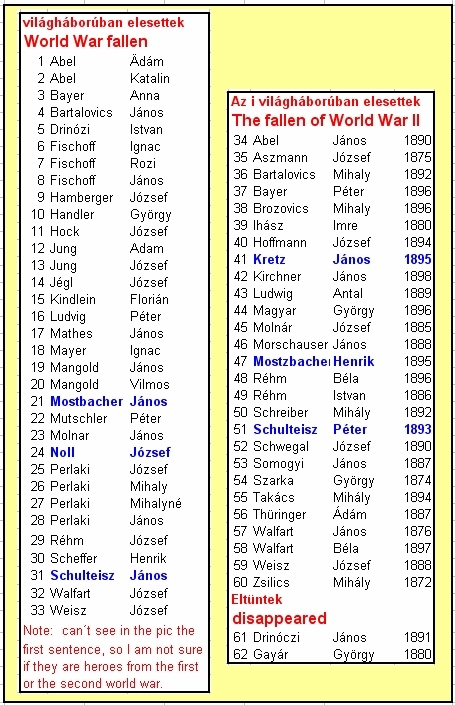 János Noll descendants (my Branch) has a separate chapter under the name Noll. 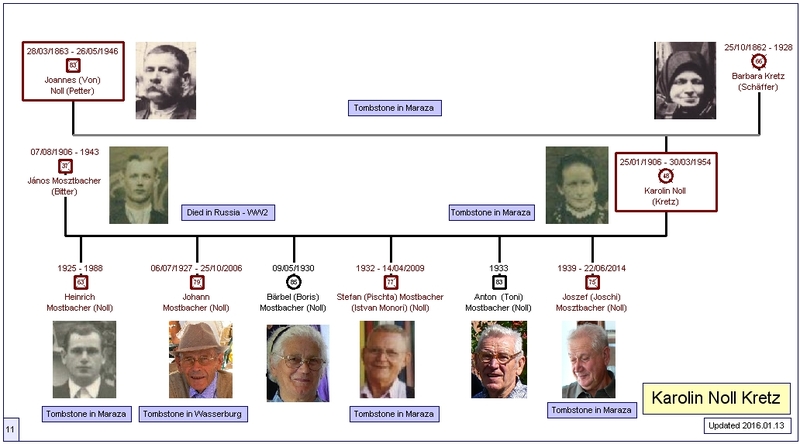 Same with the descendants of Karolin Noll (Maria’s branch) that will be done with her collaboration and with the data she would like to have in this site, under the name of Mostbacher. 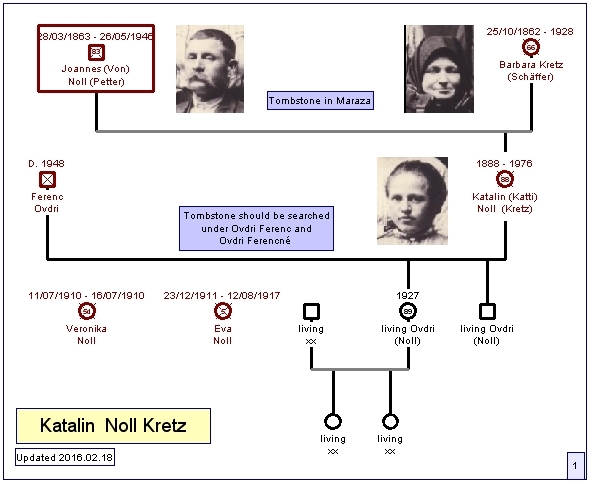 The Noll Kretz siblings, click to enlarge. Katalin (Catharina - Katti) was born around 1887-1888. Elizabeth (Lizzie) was born the 7th of July 1889. Adam was born the 29th of October 1890. Margit was born the 17th of September 1891. János, my grandfather, was born the 8th of September 1993. Gertrud was born the 30th of September 1895. Anna was born the 6th of February 1897. Maria was born the 2nd of August 1898. Terézia (Reszi) was born 24th of June 1900. Barbala was born the 29th of November 1903. Karolina was born the 25th of January 1906. Vavi. Could not find any records about her. Before 1895, records were kept by churches and can be seen in the FamilySearch Site. Priest did not write down the date of birth, but the date of Baptism, so it may be one or two days difference beetween both dates. Data was kept in Kemend, Baranya County. The civil registration, that took over after 1895 was registered in Puspöklak. There are international rules that not allow to show certificates in Internet after 70 or 100 years passed by. Could not find yet Katalin's birth certificate, but did find a birth certificate of a dauhter stating that in 1910, she was 22 years old. This will place her birth around 1888. There is data about a first child, named Veronika, that was born the 11th of July 1910 and passsed away 5 days later. A second child named Eva was born a year later, 23rd of December 1911 and passed away at 5 years old. She married Ferenc Ovdri, that passed away in 1948. Could not find any data about him. 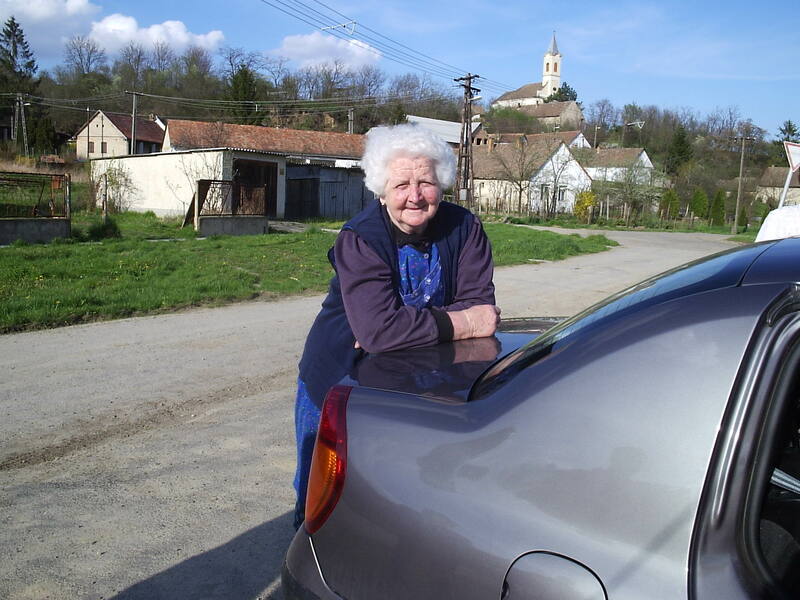 The third child, was born in 1927 and was still alive in 1996 spring, when one of her cousins paid a visit to Hungary. Lately we were told that Katti's daughter is still living in Maraza as well as one of her grand-daughters. According to the gravestone in Maräza cemetery,Elizabeth (Lizzie) Noll Kretz was born in 1889. She married Adam Spengler in Máraza, the 30th of September 1909. Adam was born the 25th of November 1888. His parents were Miklos Spengler and Eva Herchuenader. In the aftermath of World War II, he was taken prisoner by the russians and died in 1957 in the Gulag. 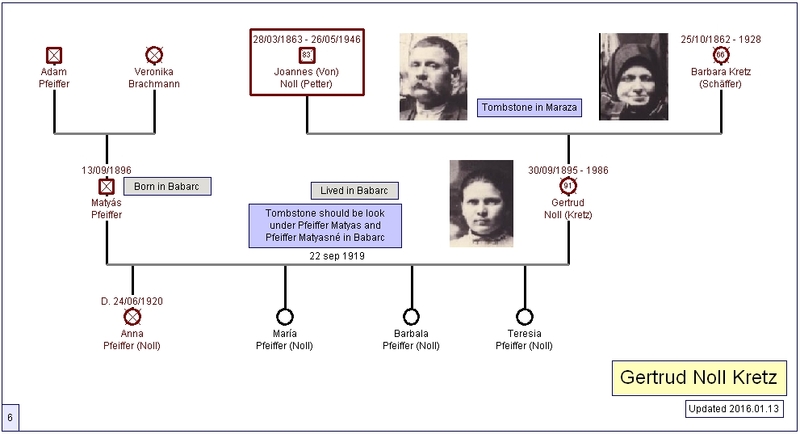 There is a birth certificate in the "Hungary Civil Registration, 1895-1980" that shows the death in Maráza of Margit Noll (1907 April 7th), 21 days old, being her mother Noll Erszebet and signing as a witness Johann Noll.Cause of death is also stated but I can not understand the handwriting. Her second child, Adam, was born 1911 March 6th and passed away being 6 years old, in 1917,December 29th. Her third child, Miklos, was born 1912 June 5th and passed away being 10years old, in 1922, Junes 3rd. Fifth, 6th and 7th children were girls: Erzebeth (Lizzie neni) that passed away in 2007 and with whom part of the family were in touch. Katalin, born 1916 November 16th, according to her birth certificate. Eva : no data about her. Maybe one of the daughters and the son are still alive. There is no data about them or their whereabouts, but Aunt Barbel said there is a Spengler, divorced and living by himself in Maráza. Also it is not known if they have descendants and where they live. 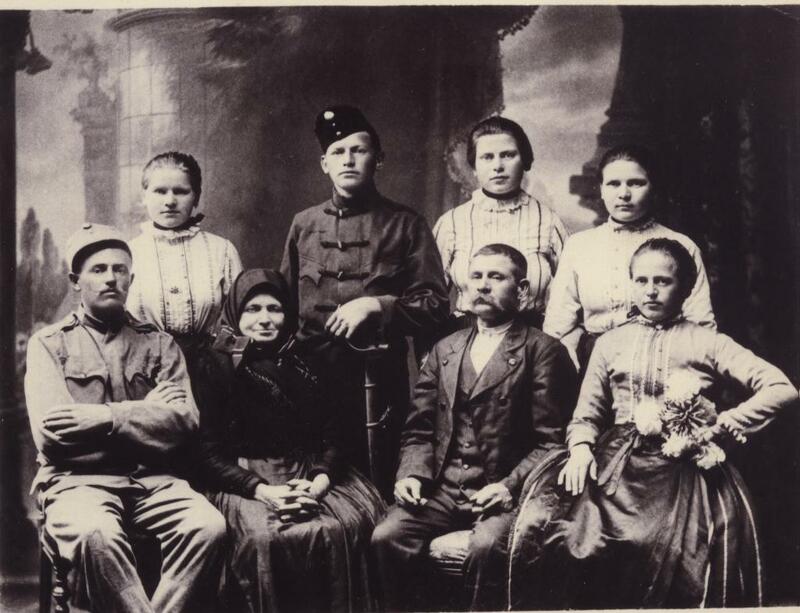 My grandfather János used to say that he was the only boy among 11 siblings. Most probably, that's what he believed, but I found in the FamilySearch archives, proof that there was an Adam Noll, baptized the 29th of October 1890. I guess that he died as an infant and no one of his siblings ever heard of him. Margit Noll Kretz was born in Maraza, the 17th of September 1891 and passed away in 1985. The 8th of July 1913, she married Antal Werner. Antal was born in Monyoród, the 13th of June 1888 being his parents János Werner and Margaretha Ritz. They migrated to Oberauerbach, a small village near Zweibrücken in West of Germany. Their first child, Erszebet was born the 5th of April 1914.She married Andreas Morschhauser and had two children. Both married and with children themselves.Erzsébet (Lissi Neni) passed away the 4th of March 1995 and is buried with ther parents and her husband. Their second, János, was born the 16th of July 1915 and passed away, 4 month later, the 11th of November 1915. The 22nd of February 1917, Antal was born. He is married and have 2 children. Cousin Maria from Germany, made contact by phone with her,but could not get to meet. Margit's husband passed away the 30th of November 1951, and Margit in 1985. 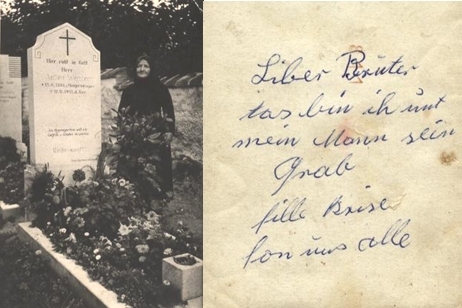 She sent a photo of the tombstone to her brother János in Uruguay. 1955 - Oberauerbach,the day of Johann Mostbacher wedding. In the photo:Lissie-neni, her two grandsons and Johann. At the back, their house. Also at the pic, Cousin Maria's first dog Nelly. Anton Werner tombstone - Photo sent by Margit Noll to his brother János Noll.On the back: Dear brother, this is my husband's grave. This is a photo of Margit Noll Kretz inmediate family. Maybe someone will recognize any of them? Gertrud Noll Kretz was born in Maraza the 30th of September 1895 and passed away in 1986. The 22nd of September 1919, she married Mátyas Pfeiffer. Matyas was born in Babarc, the 13th of September 1896, being his parents Adam Pfeifer and Veronika Brachmann. They had 4 daughters:Anna, Maria, Barbala and Teresia. A record has been found abouth the death of their first child Anna, that took place the 24th of June 192ö. Thez lived in Babarc. No otrher data about them. She married Gyula Kozma and had three children. The eldest, Gyula was born 6th of may 1926 and passed away in 1999. He left for France in 1945, where he met a Frech girl and married.His wife, Paulette Clarisse was born in 1935 and passed away in 1993. They had an only daughter. Their descendants lives in Beuvry-Pas De Calais. The second, a girl, named Barbara Anna (she changed her surname for Nemeth) was born in 1929 and passed away in 2003. She married Lászlo Cseke born in 1923 and deceased. They had two children. Their descendants are living in Kaposvar. The third girl, Viktoria, was born in Budapest in 1932.There, she wento to the Technical University in Sopron where she met her future husband to be, Stephen. I exchanged emails with Pista Bacsi and he told me that they were planning to get married around Christmas in 1956, but the revolution broke out in October in which he"ve got involved, and in November he had to leave the country to save his neck. Vicky asked her mother (Anna von Noll), whether she should leave with him and she told her yes. They escaped to Austria, got married in Vienna and went on to Paris, where they met Vicky's brother, Jules (Gyula) Kozma. He had a furniture business in Beuvry where he lived with his wife, Paulette. Later they had a daughter and they became her God-Parents. In July 1957 they emigrated to Canada. Uncle Pista passed away the 11th of February 2017. He was a very intelligent man, and he told me that he had a long and varied professional life. He was fluent in English, Fench, Spanish and Hungarian and he also studied many years German and Russian. He worked in over 50 countries on 6 continents. His last job was General Manager of a diamond mine in the Republic of Guinea, West Africa. They have an only daughter, married with no children. Maria Noll Kretz was born in Maráza the 2nd of August1898. and passed away in 1990. She married János Kablár, furniture maker. According to Vicky Kozma, they lived in Pécs where Mária had a sewing salon. 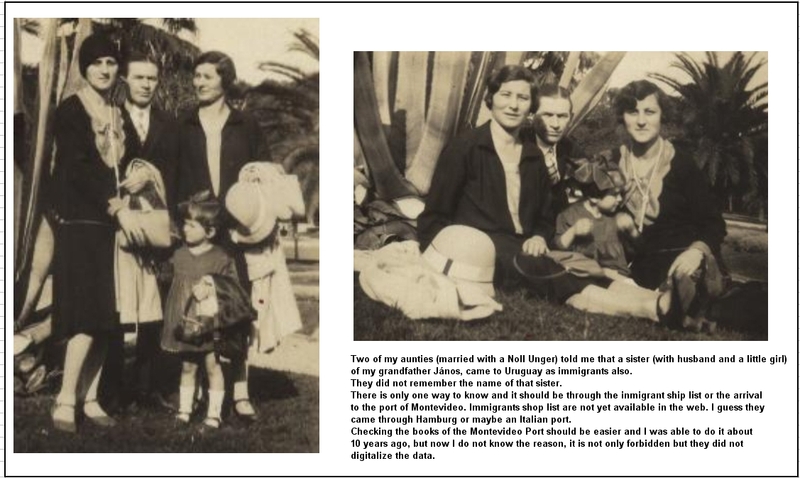 I was told that beetween 1930 and 1935, a sister of my grandfather János Noll came to Uruguay with her husband and a little girl. Most probably she was the one.They stayed for awhile and after making some money, went back to Hungary. On the way back, their girl died of meningitis. I do have a photo that was taken in Uruguay, and there is a big probability that she is Maria.I will include it here, should anybody recognize her. János sister Maria and Micike?? ?, click to enlarge. Terézia Noll Kretz was born in Maráza the 24th of June 1900. Reszi married and went to live in Bácsalmás. She had a son, József, who became a fighter pilot. He was shot down over Russia. 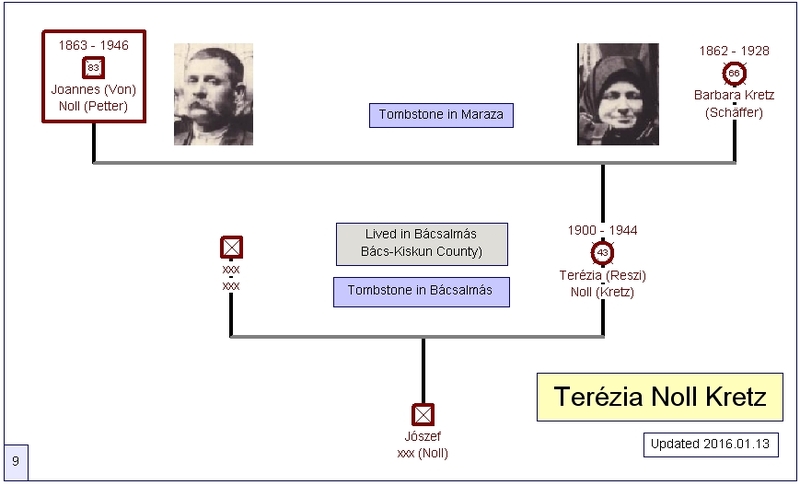 Teréz died in 1944 in Bácsalmás. Her sister Anna was at her funeral. 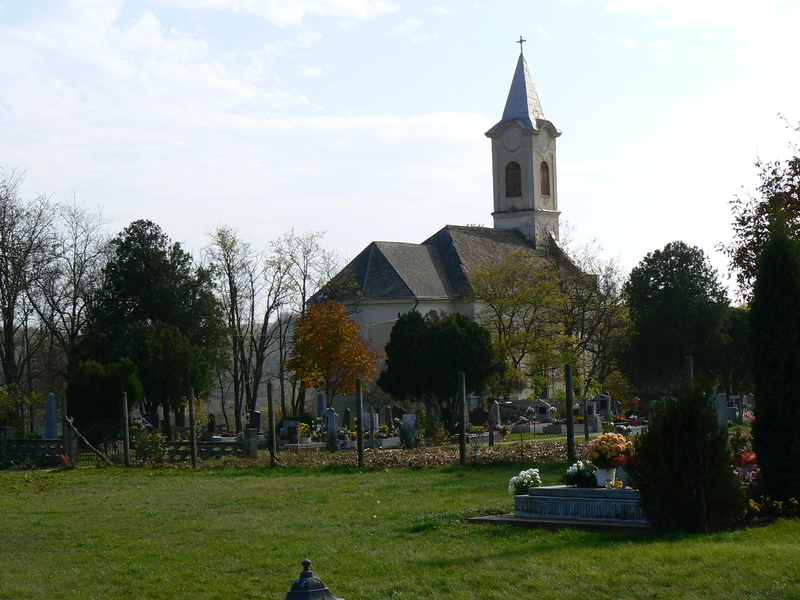 Most probably both Reszi and husband are buried in the local church cemetery, but without knowing the surname of the husband it is an impossible task to find out the tombstone. 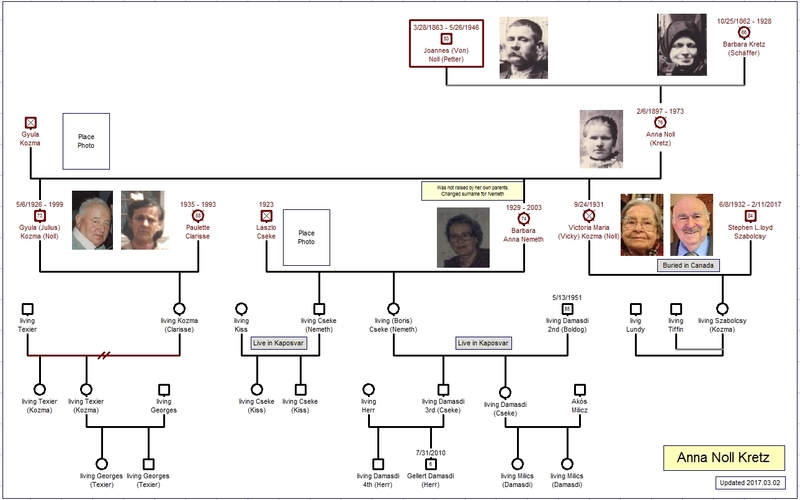 Barbala Noll genealogical tree, click to enlarge. Barbala Noll Kretz was born in Maráza the 29th of November 1903 and passed away in 1992. She married Antal Reger (1904-1935) and had two children: Antal and Margit. Antal Reger passed away at a very young age (31 years old) and is buried in Maráza Cemetery. 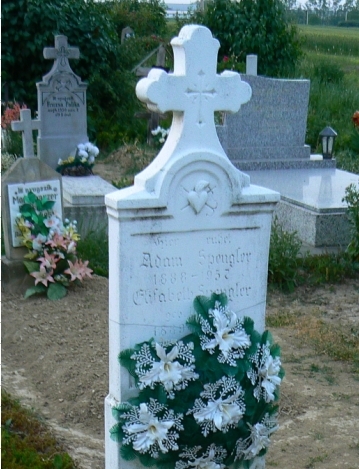 Her son, called also Antal (Toni) Reger Noll was born the 13th of June 1925 and passed away in 1981. The surviving family lives in Liptod and in Pecs. Her daughter Margit Reger Noll was born the 1st of November 1928 and passed away the 15th of April 2009. 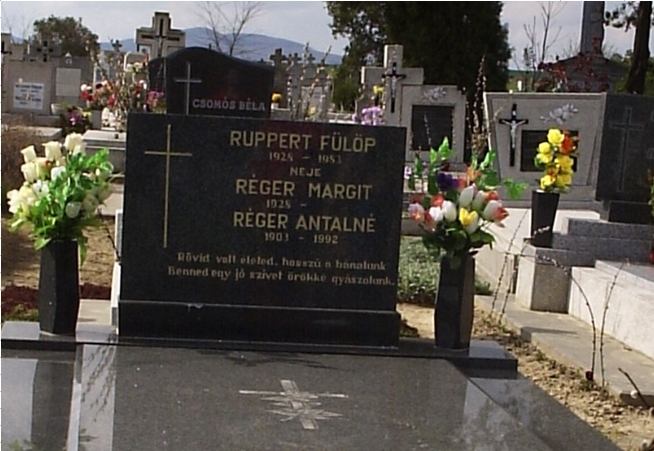 She married Ruppert Fülop, born 5th August 1928 and deceased in 1983. They were childess. Both of them, as well as Borbala Noll Kretz are buried in Maraza, in the same tombstone. Margit Reger at Maráza Church. A tipical house in Maráza - Margit Neni's house. Vavi never married, lived at home with her parents. In 1956 she was living in Maraza. I will comply with any request to include special chapters of any of the other descendants asking for it. 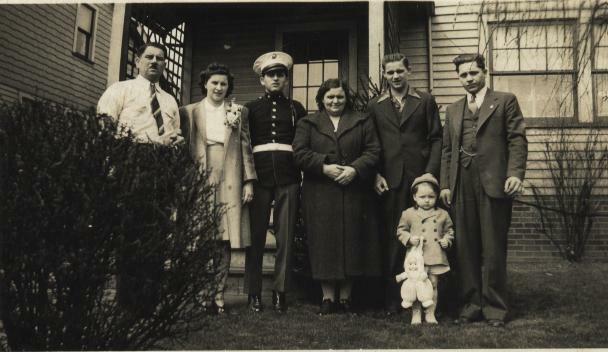 Data, photos and anecdotes about the descendants that are alive won't be in this website unless requested by the person.